Janne Junker is the initiator of the whole concept of nyt Hesteliv. She has had a lot of love for animals and horses in particular. As a child, she could not go past a horse without having to touch it and just wish it was her. She was 14 when she got her first horse, since then it has become more. 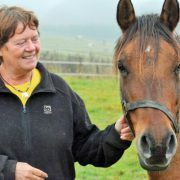 She has always bought horses for life and embraced their infirmities. 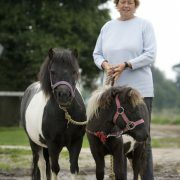 She has always stated that it was not the horse’s fault if they develop arthritis or have a tendon injury or other problems. If a problem occurred, she only took it into account during the use. I have been riding for 40 years and have had so many pleasures. I respect the horses very much, which I think the horse is a lovely and beautiful animal. It presents so many facets: beautiful, breathtaking, proud, elegance…. Today I take pride in understanding the horses, being able to communicate with them. There are so many misunderstandings between horse and rider. There are so many things that go wrong. The horse is better at understanding his rider than vice versa. I’m definitely a supporter of the horse being a pet, and I also have no preferences for the use of the horses. Whether it’s western, trotting, military, dressage, jumping, hacking, horse carriage, distancer magazine etc. is subordinate to me, there is a mutual interaction – a common pleasure – for both the horse and the rider. The horses should just be trained for it, they should be used properly without the use of hard methods. It is the mutual trust that must be built between horse and rider in a quiet and calm manner. In addition, it is my opinion that the horses in their free time must be allowed to be horses. They are going out of their boxes, out on the folds, among other horses and having their social lives with each other. They are not designed to stand in the box 23 hours a day. On the contrary, they are made to walk on large expanses and eat grass for 16-20 hours a day. I have been riding a lot of riding centers and horse retreats and have seen many horror examples of how many horses are not being properly taken care of. We can all come out in situations where we might not be able to power it for a while. Then just get the horse handed over to someone who can fit it instead, temporarily or permanently. 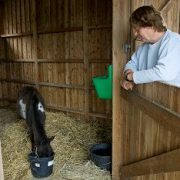 I have encountered many horses that people in good sense have lent to someone who they thought was responsible and when they see their horse again later, they have not been taken care of and have not gotten the feed they should have had. I have even encountered horses who had been outraged and stressed. Unfortunately, they ended up being killed. That risk is of course also present when selling his horse. Of course there are also many good animal peas who borrow a horse and treat them very well. Always take a look and visit your horse on a regular basis. I think it’s entirely wrong that just because a horse can not ride on more, it will be killed. It can easily work as a horse and have a good time together with other horses. There are also many who stand with an older horse or a surplus horse, who do not really know what to do. Most people want their horses so why not find a good place where they can do well. All of these factors combined meant that I wanted to establish a place where the horses could get a reel life – a new horse life. 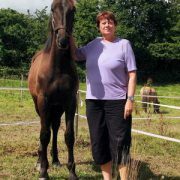 A place where older horses or injured horses could get their otium. A place where horses can get a new life with other loving people. In 2003, I was lucky to be resigned from my job as Marketing Manager. Here I had to see life in a new perspective and did not really know what I should do. In May 2004, I got the whole idea for new Hesteliv. I stood as many times before in a line in the supermarket and saw the headlines at the newspaper. Here I read that a pony was dead of starvation. 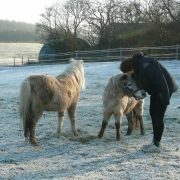 It came trembling over me, and now I knew what I wanted to spend the rest of my life for – helping horses and ponies in need. In fact, this idea has been just in front of my nose. In 2005, nyt Hesteliv became a reality. I sold my house in Helsinge, North Zealand, and bought the property in Blommenslyst on Fyn. It was transformed into a horse property, where everything stands in the horse’s sign – seen with the horse’s eyes. They should have freedom, large areas and people to service them. In 2006, new Hesteliv was given its first rescue case from Sæby in North Jutland. There were 2 horses and 1 pony that was totally starved. One was immediately put down by the veterinary – it only became 4 years. The other 2 – Anaconda and Lukas – were sent by the police to Blommenslyst, where they fully enjoyed their lives. The horse that was put down has never been forgotten, because it is now our brand of arms forever. nyt Hesteliv is unique and is not found anywhere else in Denmark. The horses that come in are never resold but are owned by nyt Hesteliv forever. We do not want to expose our horses to once again go wrong and be a potential subject for a cargo transport south. The horses will stay on nyt Hesteliv or come to a foster family where we will visit the horse 3-4 times a year on unannounced visits. Part of the nyt Hesteliv concept is also to offer courses and lectures to spread more knowledge about horses to avoid misunderstandings between horses and people. We want to have so many new Hesteliv rescue centers around the country that we always will have room to receive neglected horses.